Those are the first words you see upon loading Entwined. It weaves a story of two spirits in love and their journey to overcome the barriers that separate them. It’s a lovely premise for a lovely game, one that isn’t explored very deeply, but nevertheless manages to be moving. Entwined sees you guiding the two spirits through nine lifetimes, each represented as a long tunnel decorated with some fancy visuals. The spirits are controlled independently using the left and right analog sticks – the fish on the left, the bird on the right – which you use to point them toward matching colored gates. By passing through them, the spirits build energy that, once enough is obtained, allows them to merge into a magnificent dragon, thus ending the level. Controlling two characters independent of one another sounds difficult, but it’s surprisingly intuitive. Most of the gates follow simple, symmetrical patterns, easing you into learning to command the two entities before plunging you into more complex designs. At the start of each lifetime, you’re introduced to the basic forms the gates take for that area. Perhaps that will be long, curving strings you can take in one smooth motion, or scattered, tightly packed groups that require swift timing and movements. You’re always informed of the general form they assume, allowing you to gain a base understanding of the level’s workings. But this only lasts for the first 20 seconds, at which point things quickly escalate to more difficult and demanding arrays. In the survival-based challenge mode, there’s a clear arrangement to the distribution of the gates. Through sheer determination you can brute force your way through them, but the tighter timing that comes with the faster speed at which Entwined moves in this mode keep it from being a pure game of trial and error. It’s not nearly as forgiving as the story mode, testing your reflexes as much as your focus. It’s easy to get distracted by admiring the beautiful environments, especially the more visually explosive ones. The story mode is the opposite. Apart from the very first seconds, its patterns are unpredictable. It feels like it follows a set routine at times – the progression from easy designs to the complex certainly suggests as much – but it’s really completely random. Just when you think you’ve got it down, some out of left field surprise comes and knocks you out of your groove. But the penalties for mistakes are light; you merely lose a small slice of energy and a few seconds of your time, the level continuing onward in perpetuity until you finally manage to merge. Once you do, the dragon takes center stage, whisking you away from the tight confines of the tunnels and into a small, open landscape. An icy lake at night, for instance, auroras dancing in the sky as the moon weighs heavily overhead, greets you upon your escape from the snow caverns that came before. Here you fly about aimlessly, collecting some more energy orbs along the way. Instead of initiating further metamorphosis, however, it’s used to generate a stream of dazzling colored lights to decorate the scene. These segments provide a strong contrast to the minute-to-minute gameplay. Where you’re intently focusing on patterns and movement in the first half of the stage, in the second you’re free to relax and explore. There’s no challenge here, no overbearing goals; just a simple, peaceful space to mindlessly roam around until you’re ready to continue onward. It’s a welcome bit of respite, a chance to cool down and prepare yourself for the next lifetime. But more importantly, it grants a sense of closure. 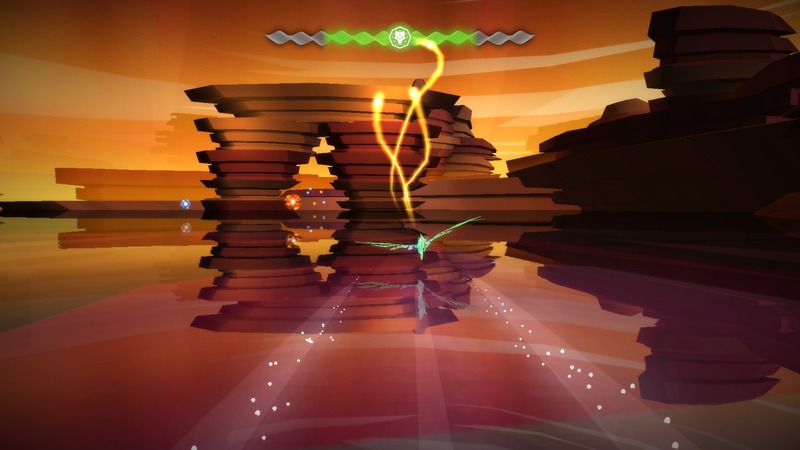 Entwined’s soundtrack follows a strict ebb and flow – much like the levels themselves. They start slow and calm, the environment forming around you as you figure out where the current lifetime has taken you. Streams of light and other abstract molds take shape, the music beginning to pick up as the melody kicks in before finding a steady rhythm. It continues on like this for a couple minutes, allowing you to savor its delights as you settle into your own rhythm. Then, just as you begin to merge, it picks up, gaining speed right alongside the two spirits, building and building until it finally reaches its peak for a brief moment of silence… only to erupt into a triumphant finale – not with bombast, but serenity. The dragon segments are ripe for exploration, a perfect way to wind down before tackling the next level. The sense of closure comes from that serenity. Each lifetime is essentially a small chapter in the overarching narrative. Every lifetime they spend together slowly brings them closer toward eternal unity, which is why the process always begins anew with every stage. To be together for a single lifetime isn’t enough; they want to be by each other’s side for all time. Entwined is light on story. Beyond the premise, it’s almost nonexistent. Trophy names are the most direct it becomes, hinting at some greater theme for the levels they’re assigned to. “Liveliness” accompanies a grand amusement park amid a sprawling city, while “ambition” caps off a trip through an expansive canyon. The connections feel tangential at best – there’s nothing that says how these concepts relate to the journey at hand. The real meat of the tale is in the gameplay. Every facet carries some meaning behind it. The two spirits are limited to their sides of the screen to illustrate the barriers which separate them, for instance, the dragon a symbol of their unity. Entwined uses these subtle cues to illustrate its narrative. It never culminates in a meaningful way, however, nor does it carry any profound message; it merely ends on the same note it began on: with a simple message. I had never heard about that game, but – based on your description – it reminded me of NiGHTS.